(Release Date: September 2, 2014)  Does "Baby Blues" want to be a "Child's Play"-style killer-doll movie? A possession thriller? An offbeat slasher film about a cursed song? A psychological drama about postpartum depression and marital infidelity? Director Po-Chih Leong and writer Bak-Ming Wong try to do too much without seriously committing to any of these angles. In effect, what they end up with is a tacky mishmash of half-formed ideas that is certainly preposterous and always weird, but never actually scary. Ignoring the warnings of an old homeless man (Hoi-Pang Lo) who has permanently set up camp across the street, young married couple Tao (Raymond Lam) and Snowy (Janelle Sing) happily move into their luxurious new home. They think their fortunes are looking up when they learn Snowy is pregnant with twins, but after one of their babies dies during birth she starts treating the mysterious doll that came with the house as her late child. Tao is assured by their physician that Snowy is merely suffering from postpartum depression, but he gradually becomes convinced that she is under the control of a malevolent force that will not stop until they are dead. Not to be outdone, there is also a story thread about songwriter Tao's creation of a death-centric pop tune called "The Intruder" that causes harm to the people who listen to ita potentially creepy subplot that peters out midway through. "Baby Blues" is all over the placea soapy melodramatic element is also introduced as Snowy and sister Trinket (Karena Ng) come to believe Tao is having an affair with the slinky pop star who is recording his songand its missing focus hurts the overly tangential narrative. Raymond Lam and Janelle Sing are an appealing onscreen couple, and Chi Ying Chang's cinematography gives the film a sleek sheen that takes advantage of some enticing locations in and around Hong Kong. The reliance on CG effects to animate the doll, however, are fake enough to pull the viewer entirely out of the movie. When Snowy is told during the climax that one of her babies didn't make it during childbirth, it comes as a surprise to her, as if no one had bothered to key her in on this crucial fact for the last several months. 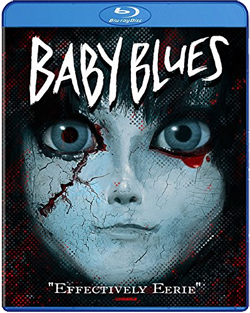 Is "Baby Blues" about an evil doll, or just the story of a young woman whose psyche is nearly destroyed by the flagrant dishonesty of the people around her? Either way, it's just not very good. Dazzling colors that really pop and a level of consistent depth and clarity not found in the world of standard-definition DVDs are the highlights of the "Baby Blues" Blu-ray disc's 1080p transfer. With the exception of a few instances of moiré patterns (seen, for example, in a high-rise building's exterior and on a garage door), there are no complaints to be had. The Cantonese 5.1 DTS-HD Master Audio (with optional English subtitles) holds a potent balance between the dialogue, the fervently composed music score, and a flurry of ambient noises that fill out the home theater environment. It's a dynamic listen. A Cantonese 2.0 Stereo audio track is also included. "Baby Blues" is an odd little number, one that should divide audiences between those who take to its loopy flights of fancy and those left frustrated by its messiness. Well Go USA's Blu-ray release is pretty great from an audio/visual standpoint, but there are no special features to sweeten the deal outside of a trailer. Definitely rent before purchasing unless you are a fan. For those not interested by the synopsis, feel free to steer clear.